Today we announced Chromecast, a small $35 device that plugs into any HDTV in your house to bring online video and entertainment to your TV. Chromecast users can cast content from dedicated apps like Netflix or from the web using Chrome, but we'd like to see more multi-screen experiences brought directly to the TV. So today, we've also released the developer preview of the Google Cast SDK, a technology that brings mobile and web content to the TV screen. You can use the Google Cast SDK to enable your mobile and web apps to cast content to the TV. 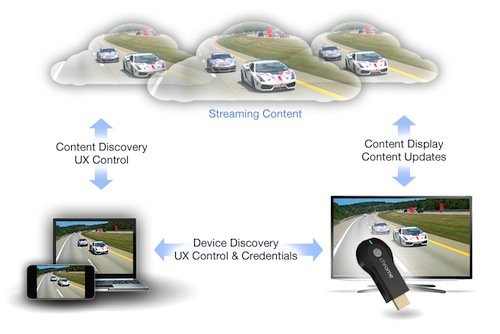 Chromecast then streams that content directly from the web. Integrating Google Cast technology into your app makes it easier for your users to enjoy their favorite videos, playlists, movies and more on the big screen, without requiring them to download a new application or learn a new interaction model. The developer preview includes the SDKs for Android, iOS and Chrome, which enable you to extend your application to the TV. We're excited to see what you build with Google Cast, and we're looking forward to your feedback as we continue to refine Google Cast. Get the Google Cast preview SDKs, documentation and samples at Google Developers. John Affaki manages the client software and services teams for Google Cast. He never grew out of childhood and spends his free time playing video games and reading comic books, but is glad to have some real kids now.